To celebrate 25 years of the Slovenian league, Telekom Slovenije produced a digital album with the history and highlights of the league. The first 750 to complete the digital album could get a printed version of the album with a set of all stickers to be glued in it. I was lucky to be one of them and here I can show you how this collection looks like. The album has a very high quality with thick paper for all pages and cover. The collection starts with few pages about the history and statistics of the league. 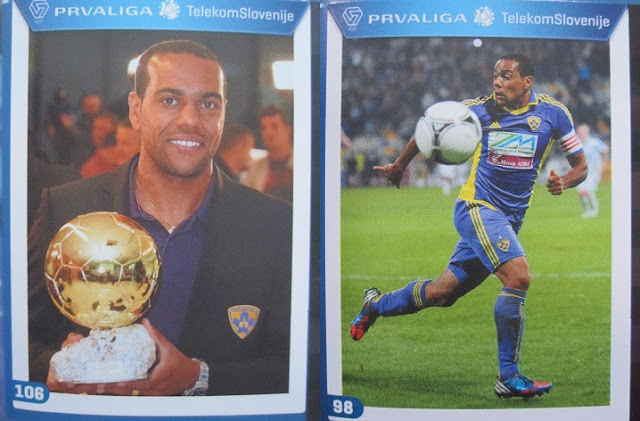 Then the first stickers appear in a section dedicated to the players with most appearances (Vecna lestvica nastopov) and goals of the competition (Vecna lestvica strelcev). There are in total 10 stickers of players in action in this sections. The players with most appearances are Gobec, Kosic, Strajnar, Brezic, and Seslar, whereas best scorers are Skaper (130 goals), Tavares (114), Bozgo (109), Rakovic (108), and Osterc (106). Then the 25 seasons from 1991/92 to 2015/16 are shown in details. Each season takes two pages with the ranking, facts, and four stickers: the photo of the winner team (Prvaki, 2 stickers), one sticker related to one specific episode of the season (Iskrica), and the sticker of the top scorer of the season (Najboljsi Strelci). The section VSI Klubi shows the statistics and the club badge sticker of all 41 clubs that took part at least in one season of the Slovenian league. There is thus a total of 41 stickers in this section. The last section of the album is dedicated to the legends (Legende) of 25 years of competition with a total of 10 stickers of players in action: Bozgo, Skaper, Srebrnic, Cimirotic, Tavares, Kosic, Gobec, Ubavic, Zulic, and Djuranovic.